Built about 5,600 years ago on the island of Gozo, the Ggantija Temples are one of the most popular destinations for visitors – and one of the world's oldest manmade religious sites still in existence today. They are astonishing not only for their age, but also because they were constructed at a time when neither metal tools nor the wheel had yet been known on the island. Just one of seven megalithic temples on Gozo and Malta, they were excavated in the early 19th century based on local knowledge of the site based on folklore. The Ggantija Temples are located at Temples Street on Gozo and are open to visitors from 9am to 5pm. The price to enter the complex is €5. It is closed on Good Friday, Christmas Eve, Christmas Day, and New Year's Day. Explore the island of Gozo by Jeep on a full-day tour from Malta. Discover both the highlights and hidden corners of Gozo in a Jeep that can travel on small country roads where larger vehicles cannot venture. Visit top attractions such as Victoria, Qala Belvedere, and the UNESCO World Heritage-listed Ggantija Temples, along with many other destinations across the island. Includes driver-guide, lunch and food tastings, transportation by Jeep, and hotel pickup and drop-off from select locations. 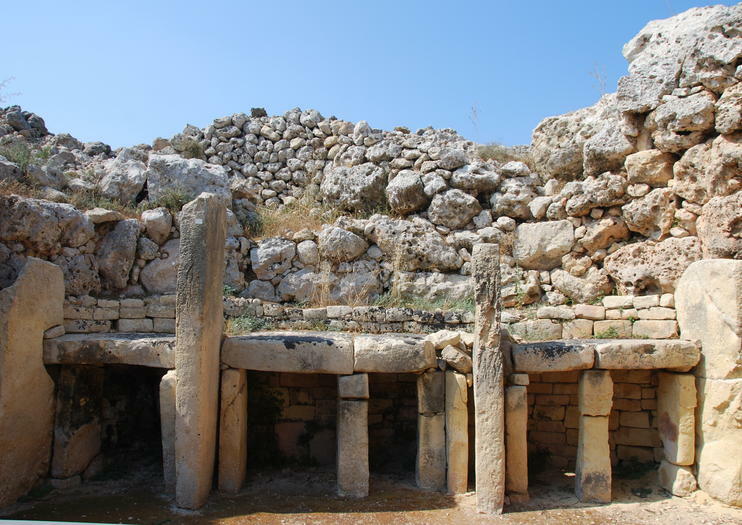 Visit Gozo and the prehistoric Ġgantija Temples on this day trip from Malta. In the company of a guide, travel to the neighboring island of Gozo to visit the UNESCO-listed Ġgantija Temples, which are among the oldest megalithic sites in the world. You’ll also see some of the Mediterranean’s most gorgeous beach vistas, visit Victoria’s citadel, and enjoy a 3-course lunch at a local restaurant. The island of Gozo is renowned for its ancient ruins and picturesque scenery, and its proximity to Malta means you can visit on a day trip. This full-day tour from Valletta includes a guided tour of the UNESCO-listed Ggantija Temples, a ride on the Marsalforn train, and a delicious buffet dinner, as well as hotel pickup and round-trip ferries between the islands. Discover the beautiful beaches and historic wonders of Gozo Island on this full-day tour from Valletta. Explore the UNESCO-listed megalithic temples of Ggantija, see Fungus Rock and the Inland Sea in Dwejra, visit the island capital of Victoria, and enjoy a delicious Gozitan lunch. See the island of Gozo by jeep on a day-long tour. Traveling through lush valleys and along off-road tracks, you’ll discover the island as few others do. As you relax, your guide navigates around the island, stopping at landmarks such as the Calypso Cave and the Gordon Lighthouse. Stop for photos at all the key sights, and savor a hearty buffet lunch with wine. Round-trip ferry transport from Malta is also included. See a different side to Gozo, the historic and sleepy island idyll, on a 3.5-hour evening tour from Valletta. Ideal for history buffs, this atmospheric tour covers the Ggantija Temples, an ancient religious site dating back 5,600 years, and the Gozo Citadel. Conclude the experience by watching the sunset from Dwejra Point. Dinner and hotel pickup and drop-off are included. Forming part of an exclusive private small group no time is wasted until the rest of the group are picked from different pick up points. It being a small group individuals questions can be answered throughout the day. What makes Gozo Malta so special? Well it’s the Gozo beaches, the charming villages, the narrow streets and the slow pace of life, the gorgeous scenery and of course the warm and hospitable people. Gozo typifies Mediterranean, with a slow pace of life that is intoxicating for wanting a break from the hustle and bustle of city life.